Hellboy movie teaser poster (2002) | 'TAIN'T THE MEAT… IT'S THE HUMANITY! The first big-screen adaption of Dark Horse’s popular Hellboy comic was released in 2004. 18 months before this teaser poster for the film was released, drawn by series creator Mike Mignola himself. 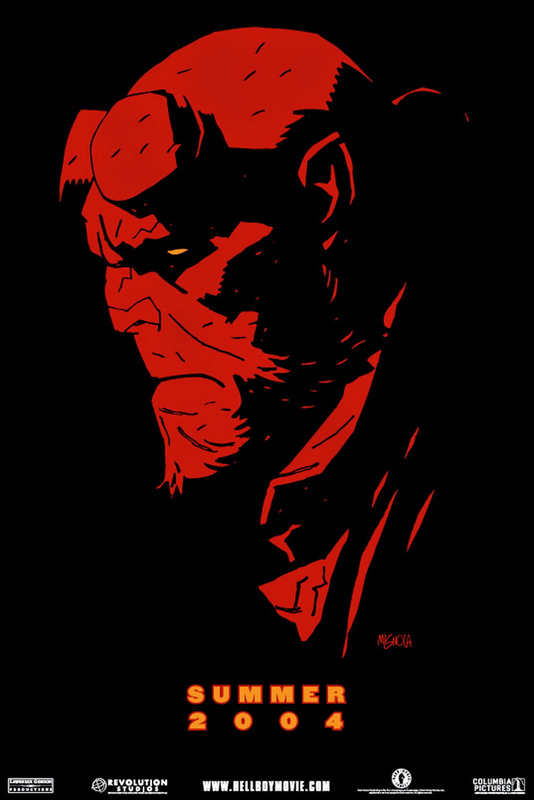 This limited-edition teaser poster of a rather brooding Hellboy was exclusive to the San Diego Comic-Con of 2002 and available for only one day, August 1st. Only 2004 copies of the poster were printed and fans of the comic had to approach one of two Dark Horse employees (Rich and Adam, apparently) and ask for a free copy. Sadly, as I wasn’t there I had considerably more trouble tracking down a copy, which I eventually did from The Cinema Store in London’s Covent Garden about three years later. And I didn’t get it for free either! Hellboy starred Ron Perlman, John Hurt and Selma Blair and was written and directed by Guillermo del Toro, who a year earlier had scored a critical hit with his creepy ghost story The Devil’s Backbone. Although Hellboy wasn’t a runaway hit (it grossed just under $100m) it did well enough to warrant a sequel, Hellboy II: The Golden Army in 2008, which did considerably better. A proposed third film has been languishing in development hell for years – quite appropriate considering the subject mater. Thanks to its small print run, copies of this exclusive Hellboy teaser poster are incredibly difficult to find, so fans may just have to content themselves with looking at the nice hi-rez scan at the top of this post.